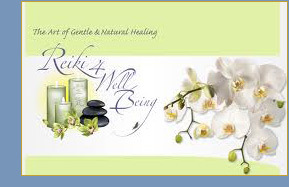 Welcome to exploring the wonderful benefits of Reiki [rā•kē] n. Reiki is a spiritual healing practice that balances the mental, physical, emotional and spiritual bodies. This natural healing system aligns our energy centers and brings overall health and well-being on all levels. Reiki is a hands-on energy healing therapy that is performed through a gentle and light touch, facilitating the natural flow of energy from the Reiki practitioner to the receiver. This is a therapy that is known to heal, improve and balance ones mind, body and spirit. Malina is a Reiki-Master. Her sessions are very deep, relaxing and beneficial on an emotional, mental and spiritual level. Those who are suffering from episodes of depression, anxiety and panic attacks can benefit from this therapy. It also address addictions, metal concerns, emotional problems, cancer and autoimmune diseases. After a therapy session the patent's energy is balanced and restored. At this point, the bodies natural energies allow the healing process to begin and proctes the body from any unwanted energy to enter the body again. The aura is an energy field that surrounds the physical body like a bubble. It is an electromagnetic field of light. The colors of the aura have been found to reflect the body's emotion, feelings, and health. The aura changes as these features change. Every person's aura is unique. The exchange of energy with others is occurring constantly, so the aura shifts and changes constantly as well. By studying the colors and changes in the aura, experts can discover the person's level of spiritual and emotional wellness and uncover details of their physical health. Through awareness of the aura and its changes, the patient can begin to improve his or her own emotional and physical well-being. 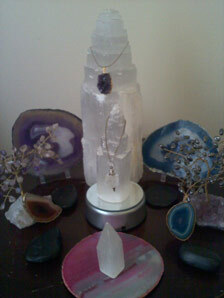 The goal of aura balancing is to have a strong, clear energy field. The more balanced the energy, the more it can flow through the system on all levels, improving vitality, physical health, and spiritual well-being. An aura is a luminous energy field that surrounds all living things. That is called a Halo. Ideally the aura should be clear, bright and glowing with vibrant colors. However the aura can become tinted dark shadows and attract dark clouds with unwanted dark energies. This tainted aura can leave you feeling ill, tired, down hearted and lonely. Worse it can attract more negative energies. And fail to attract positive energies. This vicious circle can lead to more challenges and difficulties being dawn towards you. Malina's Aura cleansing can combat negative energies and help clean, brighten and heal your aura. Spiritual Cleansing is a type of healing. A spiritual cleansing is not a medical treatment nor is it intended to take the place of one. It is disighened to harmonize the human body. To maintain a healthy, peaceful, fulfilling life style. 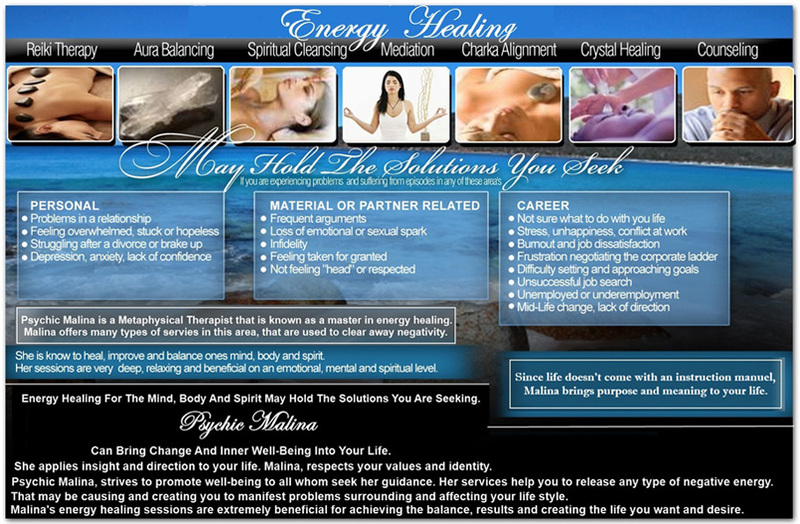 Malina offers spiritual cleansing to heal the body within. To maintain inner well-being, joy and happiness. She re-balances a pathway of success, wisdom, wealth and protection into ones life. Spiritual Cleansings have three components. The first phase involves gathering information about the problem at hand. This part of the process occurs during the initial interview. I usually spend about an hour talking to the client about their presenting symptoms and associated concerns. The second phase involves the spiritual analysis. In this phase of the cleansing, I examine the aura, soul structures, and associated energetic components of a client’s physical body. This allows me to tune in to their energies at an even deeper level. Over the years, I have developed a number of clairvoyant abilities that allow me to sense a variety of different forms of spiritual pathology. Many clients find that simply knowing about the true source of their problem is extremely helpful. The third phase involves treatment recommendations for the problem(s) that are discovered during the consultation and analysis. There are three levels of cleansings that are available. Level One, Level Two, and Advanced. A feeling of heaviness and lethargy associated with intense negative energy. Tired of suffering and struggling to succed in personal life, finanece, health, and family. A Level One Cleansing: involves the recommendation of a series of products and procedures that the client can carry out on his/her own. This cleansing is reserved for the lowest levels of pathology. Surprisingly, some clients are able to take care of their own problems with ease once they are given proper guidance and direction. This cleansing also involves the use of a healing talisman and mantras. In most level two cases, I need to apply more time and expertise in order to address the problem. Level Two Cleansings are treated through the use of sealed mantras, intercessory prayer rituals, and shamanic procedures that are designed to rid the client of the attachment. Stones of Power are often prescribed in order to raise the client’s base vibratory rate. This helps to prevent future reattachment and generally improves the client’s overall health and well being. Advanced Level Cleansing: is reserved for the highest level of spiritual pathogen. These entities often require direct face to face intervention in order to be removed. I have also had a great deal of success with distant cleansings as well. These entities often require a great deal of time and effort in order to be removed. These entities are often associated with very negative emotional, physical, and mental conditions. Furthermore, the clients that tend to be affected by these entities are often surrounded by negative people and living conditions. The entities can be removed, but the client will also need to address the surrounding circumstances that support the attachment(s). Sometimes, the karma of an individual dictates the existence of an attachment for a specified amount of time. The session includes dependent thought forms, low level miasms, and human souls that are weakly attached to the clients physical form. A dependent thought form is a type of energy pattern that results from strong persistent thought, emotion, or act. Dependent thought forms cause a great deal of chaos and strife when they enter the body but fortunately, they are easily removed. * Past life personalities can often bleed through and cause trouble in the present personality. Activates your body’s self-repair mechanism, helping you cure yourself with your own life-force. Through a unqie level of medation. Malina will go into deep medation and prayer on your behalfe, working with your engery. Then she will give you a tailored medation that is deighed for your induvale wants, needs, desires, hopes and goels to achevice. By using this medation as Malina instrustes you. You are able of banish many difficualt sitawaytions your not attened to go through. And realease your engery to cleanse any unwanted negativty. Procting your present and future to bring to come only whats meant for you to go through. Pranic healing has been demonstrably effective not only in healing both physical and psychological ailments but it can also help to prevent illness by harmonizing one's physical, emotional, mental and spiritual energies. It strengthens the immune system and enhances the vitality and quality of one's life, health and happiness. It can be used for self healing and healing other people even thousand miles away. For life to exist, the body must have prana, chi or life energy. The healing process can be accelerated by increasing life energy on the affected parts and on the entire body. Prana or ki is the life energy which keeps the body alive and healthy. This energy is subtle but pervasive. The natural condition of the body’s energy is balanced. When the body’s prana or ki is too much or too little, it becomes unhealthy. The result is the body is unable to function properly, and eventually presents symptoms of illness. 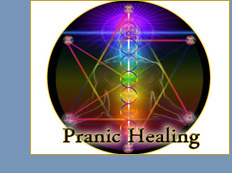 In Pranic Healing, physical ailments are treated through the subtle energy of the patient using prana thereby assisting and accelerating in several degrees, the body’s natural ability to heal itself. The healer is able to feel or ‘scan’ the diseased energy in the body. After checking the area for imbalance, the healer proceeds to clean the dirty energy and then energises the affected area. It is akin to cleaning a dirty vessel and then filling it with clean water. Beginners are taught about the composition and laws of the energy body or aura. 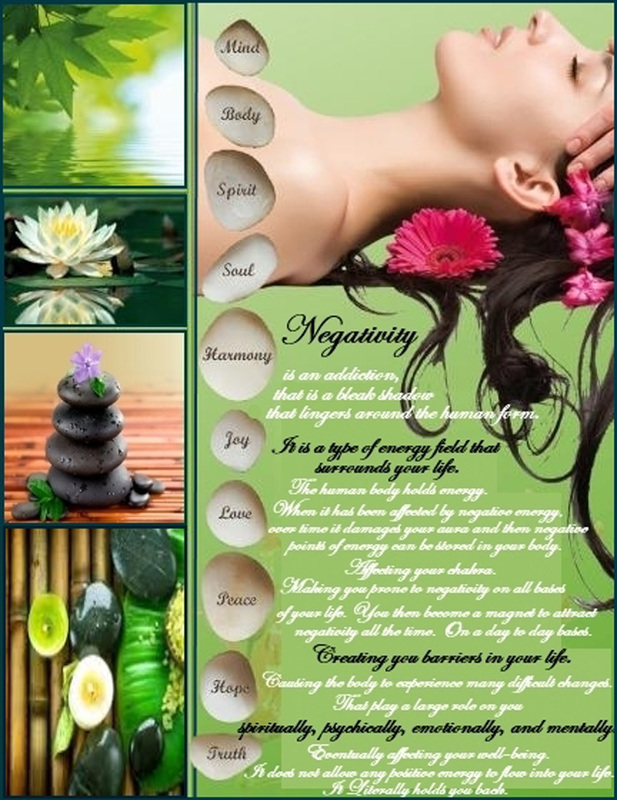 It covers the number of chakras/energy centres and their uses, the technique of scanning, cleansing and energising affected area and many more techniques. Once we are able to feel and interact with this energy, we can heal, change the energy of a place, room, office, send energy to people, places or things. Since energy is everywhere, there is no limit to how we can use it. It also includes character building, pranayama, twin hearts meditation, law of karma with techniques to heal oneself and others from a distance. Pranic psychotherapy deals with emotional and mental problems of patients and effectively tackles drug addiction, smoking, alcoholism, depression, stress, worry, traumas, phobias. With medical studies suggesting that up to 80 per cent of ailments are traced to emotional and psychological problems, this course is a powerful tool to combat all forms of emotional anguish. The first level, Basic Pranic Healing deals with the principles and basic techniques, enabling the client to heal simple physical ailments. The second level , Advanced Pranic Healing, makes use of advanced techniques and colors, thereby shortening the healing time. The client is then familiarized and taught treatments for more severe chronic ailments. 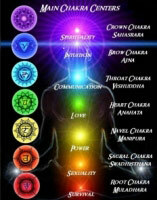 There are seven main energy centers in your body called chakras. The seven energy centers represent the seven colors of the rainbow, that represent your Aura. If your charka points are blocked by negative energy, it stops positive energy to flow through your charka symptom. Having negativity in your charka's points. Causes you personal imbalance problems. Effecting your sexual life, Financially unstable and emotionally unstable. Malina, focus on re balancing your charka alignment. Her mediation sessions are intened to eliminate negativity. The first chakra (root) actually hangs outside of your body. It is located between your thighs, about halfway between your knees and your physical body. The seven chakra (crown) is located on the top of your head. The remaining chakras, (sacral, solar plexus, heart, throat, and third eye), are aligned in sequence along your spine, neck, and skull. Individually, your chakras look similar to funnels with petal-like openings. Having your chakras evaluated by a trained practitioner is a good way to get a better understanding of how your body functions on an energetic level. An energyworker trained in reading chakras will be able to tell you which chakras are functioning poorly and which chakras are working overtime. 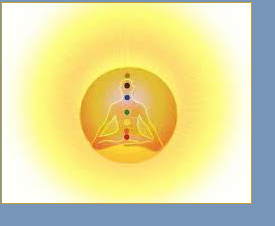 When one or two chakras are performing at a reduced level, the remaining chakras have to pick up the slack. Having a non-functioning chakra can effectively "cause the body to shut down" not ableing the charka point to regain back into posstive. Otherwise atfected chakra, Is Not Recondmened. Confused and lost in their lives. The persons body becomes a magnet to negativity, and will not allow positive in. People experience a range of benefits from Malina's Crystal Therapy Sessions. This is particularly helpful for the following. Healing is based on the principle that there is a universal energy which is freely available to all, and which can be used for the purpose of restoring harmony, balance and health. During an energy healing session the practitioner relaxes and opens his or her awareness to the universal energy that is all around us. The practitioner draws in this healing energy and then directs it outwards, passing it on to the client. The client does not receive the practitioner's energy, but only the chi, prana, life force that the practitioner is channelling. Healing is a very natural, gentle therapy treating the whole person. Increasingly it is being recognised that disease is often the end result of an imbalance on some level of our being: physical, emotional, mental or spiritual. Preventative health care can help us stay in tune with ourselves leaving us feeling more contented with our lives as well as healthier. True healing is the restoration of health on all levels of our being. It is a process of clearing through blockages that have caused our disease. We each heal at our own pace and in our own way and as we become more in harmony with ourselves we also find we are more in harmony with our surroundings and with those around us. The Crystal Therapist selects appropriate crystals and works with their individual therapeutic properties in a variety of ways. Crystals may be placed on or next to the client. The healing session is then orchestrated by the client's own 'innate healer'. A Crystal Healing session lasts approximately 45minutes. Malina Speclizes In Psychologists. Her primary goel of conseling is to help you identify the change and suport you in making the changes you need. Malina combins techniques fro fields of the human development, coaching, psychology and traitional psychotherapy to heal past wounds and promte new growth. It's practical and effective way to creat change in life. This type of conseling has many names: couples conseling, relationship conseling, marriage conseling, premairit conseling, re-mataial onseling. The fact is that couples come to conseling for many reasons. Not feeling "heard" or "respeated"
Most couples benifate from inproved commution and conflict - mangement skills, learning to shortut arguments, to listen respectfully, to voice one anothers needs, to ecspress respect and appreation. Couples conseling is not only about solving problems. Malina works with you to strenghten the foundation of the reationship, rediscover the posttive that brought you together in the first plae. And create new habits that bulid up, rather then undermine the realtionship. 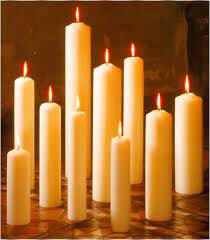 Malina helps you to become a strong posstive couple that is resillient against stress and setbacks. Sometimes conseling is the best thing we can give to our reatioship or our marriage. 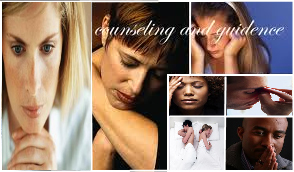 Malina's individual counseling is designed to heal past wounds and promote present growth. It's a practical and effective way to create change in your life.